#script to remotely concatenate files. echo "Cannot cat a directory"
ssh [email protected]$remote_host "cat $temp_folder/$file_name >> $remote_file && rm -rf $temp_folder/"
echo "rcat $local_file [email protected]$remote_host:$remote_file"
the bad thing about the script right now is that it will ask for authentication twice. But the good thing is that you need not manually sync the files and then concatenate them. The syntax for the remote file is similar to rsync, scp etc. There is a utility "ssh-copy-id" to copy the public keys across systems. 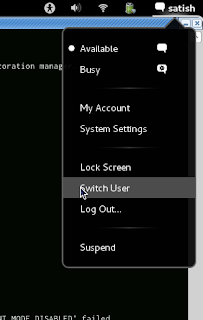 The status menu, which is the dropdown menu to the right most corner on the top panel in gnome 3 contains the Suspend option. This is an alternating option, if you focus on the Suspend option and hit the "Alt" key, you will also see the "Power Off" option. But I wanted the "Power Off" option to be shown in all cases along with the Suspend option. Here is how I dissected the issue (for the facts, this is the first time I am even looking at gnome 3 code). 1) Located the gnome-shell repository at http://git.gnome.org/browse/gnome-shell/tree/, searched for "Suspend" , and landed at the commit, http://git.gnome.org/browse/gnome-shell/commit/?id=610c2b59872029bceb0279b24dc9637a85f54968. 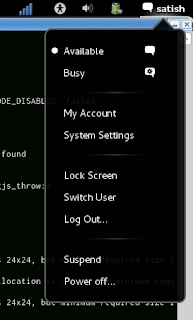 --> Made the Suspend option a non-alternating Menu item and display it only if we have suspend support. --> Added the Power Off option as a new menu item and added a function which would be called when the option is activated. 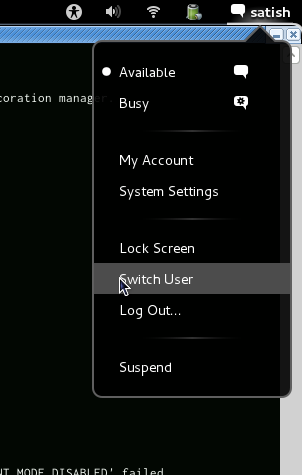 Voila , I now have the Power Off option as a separate option. Here are the before and after screenshots. The patch to the latest trunk of the gnome-shell repository which does this is here. For compiling the gnome-shell code once you have made the changes, follow the usual, "configure", "make" steps and then run "gnome-shell/src/gnome-shell --replace" to use the newly compiled gnome-shell instead of your existing gnome-shell. This post is more aimed at providing a general flow for fixing issues, not really much in here. We are going to use the repository http://https://github.com/eerpini/git_demo all through the process as the remote repository. It only has a single file, README, and has just one commit with the default branch. and then change into the directory git_demo. $ git commit -a -m "Adding a new file to the repository"
Note you can now get the change as a patch by doing "git format-patch -1 HEAD". But that is not our goal. 5) Just like above lets commit some more changes(add another file for simplicity). $ git commit -a -m "Added the second file to the repository, this should be the second commit"